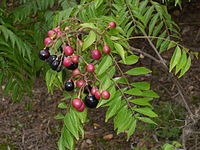 ^ "Murraya koenigii". Germplasm Resources Information Network (GRIN). Agricultural Research Service (ARS), United States Department of Agriculture (USDA). ^ a b c Norman, Jill (2002). Herbs & Spices: The Cook's Reference. New York, New York: DK Publishing. pp. 212, 213. ISBN 0789489392. 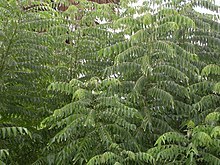 ^ a b c d "Curry Leaf Tree (Murraya koenigii)". Heritage Garden. Retrieved 2019-04-02. ^ a b Rashmee Z Ahmed (30 September 2004). "Traditional diabetes remedy offers hope". The Times Of India. ^ Sankar Ganesh, Ravishankar Rai; et al. (2015). "In vitro antibiofilm activity of Murraya koenigii essential oil extracted using supercritical fluid CO2 method against Pseudomonas aeruginosa PAO1". Natural Product Research. 29 (24): 2295–2298. doi:10.1080/14786419.2015.1004673. ISSN 1478-6427. PMID 25635569.